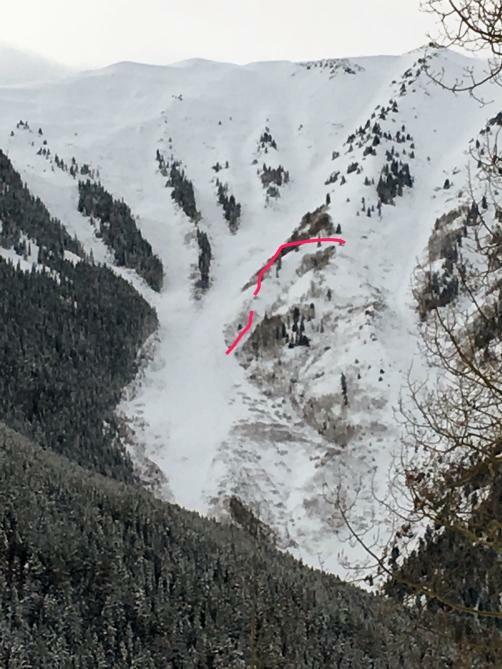 An avalanche in the 5 Fingers area of Highlands ridge. The magenta line marks the crown. A heavy, wet winter storm has brought lots of snow and statewide avalanche warnings. A warning means natural avalanches large enough to bury or kill a person are very likely. Across Colorado, both natural and human-triggered slides have closed roadways and made backcountry travel treacherous. Ethan Greene, director of the Colorado Avalanche Information Center, said this is because of the high water content in the snow. Some areas like Vail and Schofield passes are seeing in excess of 8 inches of water from the storm. “And that’s just a huge amount of weight that’s building onto our snowpack,” he said. Most high-elevation passes have seen natural avalanche activity in the last two days. A large slide early Tuesday morning closed Vail Pass for much of the day, and the Colorado Department of Transportation advised drivers to avoid the I-70 corridor. Greene said it’s likely that avalanche warnings will remain through Friday, as the snowpack adjusts to the new load. Highland Bowl remained closed Monday after a series of large avalanches the day prior.